Sunday brunch is always one of Johnny Boy’s favorite drinking times…well to be honest, any time is a favorite drinking time 🙂 But what better way to have brunch then to be surrounded by great art. 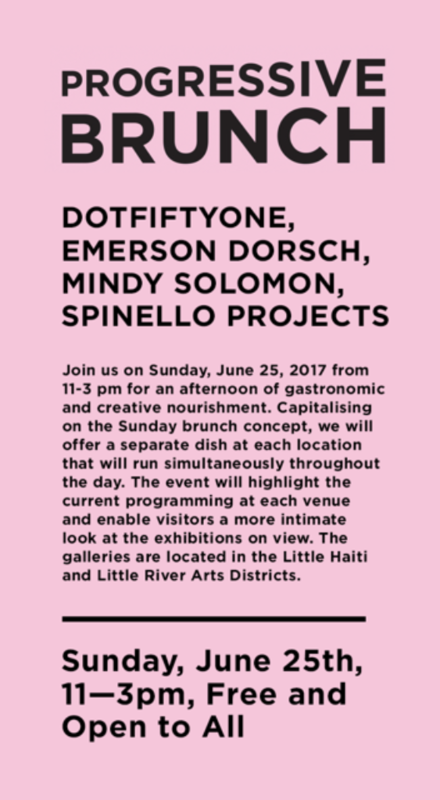 This Sunday, June 25th, 2017 from 11am – 3pm, Dot Fiftyone, Emerson Dorsch, Mindy Solomon, and Spinello Projects are hosting a progressive brunch, an afternoon of gastronomic and creative nourishment. Capitalising on the Sunday brunch concept, the four galleries will offer a separate dish at each location that will run simultaneously throughout the day. Bring your best bottle of champers to go gallery hopping and support local! Gallery addresses and website information are below. Dot Fiftyone Gallery current exhibition Resonant Relationships is Jorge Cabieses premier solo show in Miami. The exhibition includes new paintings made of polyurethane paint on aluminum panels, silkscreens on antique gobelins tapestry and on cotton paper, and other mixed media installations. Amplifying and multiplying the presence of geometric forms through the generation of repeated patterns and a pre-visualized display of shining color spectrums, the artist builds images pointing to diverse cultural sources. Jorge Cabieses was born in 1971 in Lima, Perú where he lives and works. The exhibition closes June 25th. Iron Oar, Robert Chambers’ solo exhibition of kinetic sculptures is on view at Emerson Dorsch until July 8th. Chambers is a Miami legend. With his corkscrew wild hair and his rapid fire barrage of ideas that meld art & molecular biology or physics, his persona is archetypal – even romantic. He has built upon the second part with storied and historic studio visits – more like happenings really – in his backyard jungle-studio-paradise in Coconut Grove. And with solo shows at the Sculpture Center in New York and the Laumeier Museum in St. Louis, MO, as well as a number of significant public art projects, the impression he makes holds ground. About a year ago, he took the helm at the Sculpture Department at FIU, where he overhauled their facilities with the help of an enthusiastic team, including a new foundry that can cast up to 700lbs of bronze. He has used the newly renovated sculpture lab to create Iron Oar, his first solo show in Miami in more than a decade. Spinello Projects is pleased to present Mere Façade, a curated group exhibition consisting of twenty Miami-based artists and cultural producers. The multimedia exhibition includes new, old, and revisited works by Kevin Arrow, Eddie Arroyo, Zack Balber, Franky Cruz, Cara Despain, Nicole Doran, Mauricio Gonzalez, Sinisa Kukec, Angel Garcia, Justin H. Long, Michael Loveland, Nice’n Easy, Jessy Nite, Oliver Sanchez, Tom Scicluna, Serge Toussaint, Agustina Woodgate, Antonia Wright and Bunny Yeager. Exhibition through August 5, 2017. Click here for press release. On Sunday, June 25th, the gallery will unveil a new interactive sculpture, FACING WEST, by Sinisa Kukec. Mindy Solomon is pleased to present Clippings and Hard Fruit, a solo exhibition of the work of artist David Hicks. Hicks will activate the full gallery space with wall works, sculptural installations and tabletop pieces, exploring his interpretation of the flora and fauna of the California landscape. The artist will be present at the opening.